Copyright & Revisions: Original copyright © 2006. Reformatted in 2013. No changes made to text. Publication History: Originally published in the Proceedings and Research Symposium Abstracts of the 20th Association of Outdoor Recreation and Education Conference. Citation: Watters, R. (2006). Standards-based accountability in academic outdoor education programs. In W. Taylor, G. Kay, T. Coates, G. Hanley, L. Morgan, & B. Wolfe (Eds. ), Proceedings and Research Symposium Abstracts of the 20th Association of Outdoor Recreation and Education Conference. (pp. 123-132). Whitmore Lake, MI: Association of Outdoor Recreation and Education . Educational accountability had its beginnings in the 1970s when researchers began to apply concepts from the business world to education. The concept picked up steam and eventually became the basis of a national educational reform movement known as the "standards based movement." While initially applied to public schools, the standards-based movement is now poised to bring significant changes to higher education, and those working in the outdoor education field at colleges and universities should be prepared for it. The majority of this paper describes the process by which outdoor education standards were developed for a four-year degree program at Idaho State University. Other colleges and universities may wish to review the material presented here as a guide when developing their own standards. The paper concludes with some cautions about the use of standards based methodology. Educational accountability had its beginnings in the 1970s when researchers began to apply concepts from the rough and tumble world of business to the educational field (Ornstein, 1988). By the 1980's, it had picked up speed, and accountability had become the basis of a national educational reform movement. Referred to as the "standards based movement," it involves, according to an article on the Education Week(n.d., para. 2) internet site: "[s]etting rigorous academic standards, measuring student progress against those standards, and holding students and educators accountable for meeting them . . . ."
In 1989, then President George H. Bush, along with the nation's governors and business leaders added more fuel to the movement at the National Governors’ Association’s Education Summit held in Charlottesville, Virginia . At the conference, the president and governors agreed upon national goals including the setting of academic standards, regular testing of students, and accountability for failure to meet standards (Walberg, 2003). Congress followed in the 1990s with two significant pieces of legislation. The first passed in 1994 was the "The Goals 2000: Educate America Act" (H.R. 1804), The act addressed standards-based educational reform, providing resources to identify crucial academic standards. The second, and a part of the Clinton administration's school reform efforts, which also passed in 1994 was called "Improving America's Schools Act" (H.R. 6). Among other things, it required states to develop content standards and tests linked to the standards. The movement was at full speed with the election of George W. Bush whose agenda included the "No Child Left Behind" legislation (Public Law 107-110). The legislation was signed into law in 2002. An important part of the act was to bolster achievement of schools by raising standards and holding schools accountable to those standards. Much of the emphasis in the standard-based reform movement has been directed toward primary and secondary schools, but with public and political interest at an all time high, colleges and universities are clearly in the cross hairs. That's not to say that higher education has completely resisted the movement. In fact, portions of the standards-based educational reform have been adopted by colleges and universities. Accreditation bodies, in particular, look for assurances that academic standards are being met. Nevertheless, legislators want assurances that tax supported institutions are producing results, and demands similar to those faced by public schools are on the horizon for higher education. "Coming Soon to a College Near You: Accountability" is the title of an article that appeared in Connection: New England's Journal of Higher Education. S. Paul Reville (2006, para. 2) wrote that "[a]n unstoppable movement is underway to impose more rigorous accountability on colleges and universities. It is inevitable and unavoidable that the rigorous accountability of the kind applied to K-12 schools will now be applied to higher education. If the K-12 field's overemphasis on testing is to be avoided, leaders will need to embrace the new accountability movement and help shape it. Those who resist it will suffer its imposition upon them." Standards. Standards. Standards. That is what lies in the future according to Reville (2000, para. 7). "These standards will more clearly define their respective institutions, help to guide the work of the faculty, shape the development of performance indicators and assessment mechanisms and send signals to students about what is expected." Reville concludes with a fundamental question: "What specifically should students know and be able to do as a result of their education?" All this meant very little to me until one day recently my Department Chair asked me to develop standards for the outdoor education major offered at our university. Standards? I had never really thought much about them. I've always thought more in terms of what is it that my students need to know. If I'm teaching an avalanche class, for example, I'll ask myself what do my students need to know to keep themselves safe in the winter environment. Or, if I'm teaching outdoor leadership, I'll ask myself what do my students need to know to be effective outdoor leaders. I never thought in terms of standards. Nor were standards on my mind a few years ago when I was asked to develop both an outdoor education minor and major program for our university. Rather, at the time, I was more interested in what other colleges and universities were teaching. Consequently before putting together the curriculum, I spent a considerable amount of time examining the requirements of major and minor programs offered in the U.S., Canada, Great Britain and Australia. The final curriculum proposal combined what I had learned from that research along with our strengths as a university and my best judgment of being in the field for many years. That process, of course, did involve standards -- an understanding of what others consider important subject matter in the field -- but I had never connected the process with standards based accountability. Nor had my college asked me to make the connection. Why now was the Department Chair asking for standard information? In a word: accreditation. It was needed for accreditation documentation. As Paul Reville (2006) wrote in the article quoted above, accountability is coming and it is coming soon. For me, it was no longer coming soon. It was here. This paper is about the process that I went through in developing outdoor education standards for our university. All in all, I found that the process was worth the effort. It required that our department look carefully at what we were doing, and whether the content provided in our curriculum was relevant -- and whether it would, indeed, provide for our students' future. There are different types of standards, but the type of standards that most outdoor educators will be dealing with are called "content standards." According to Educational Week (n.d., para. 3), content standards represent "basic agreement about the body of education knowledge that all students should know." Thus, when faced with developing standards, our job becomes one of deciding what subject matter should be included in an outdoor education major. Much of the rest of this paper describes the process in articulating standards for the Idaho State University (ISU) outdoor education major. It is hoped that this might be helpful to outdoor educators at other colleges and universities who may be faced with the same task. As a caveat, this information should be used a guide, and not gospel. You'll want to adapt and write standards so that they provide the best match with your program. The process used in developing these standards began with explorations into what others have done in the area. Once that was completed, a comparison was made with the existing curriculum at Idaho State. Finally, five general outdoor education standards were formulated, along with a list of relevant content topics associated with each standard. Outdoor educators understand the disciplinary concepts of teaching, leading and programming outdoor activities; and the intellectual, historic and philosophic foundations of the fields of outdoor education, physical education and movement science. * Since the outdoor education major for which these standards were developed comes under the Department of Physical Education and Sports Science, students take several core physical education classes. The content topics for the physical education course work were left up to the experts in those areas and have been omitted from this paper. Outdoor educators understand methodologies of teaching outdoor activities; have gained practical experience in the preparation of instructional plans and materials; and are knowledgeable of the concepts, models and practices of leadership in an outdoor environment. Outdoor educators understand the principles of running safe activities; have been exposed to analytical and procedural approaches in responding to outdoor emergencies; and know how to minimize the environmental impact of groups when traveling and camping in natural areas. Safety skills and knowledge of one or more of the following: backcountry navigation, river safety and swiftwater rescue, climbing safety, backcountry survival, and avalanche safety. Outdoor educators are knowledgeable of the natural history sciences; have an appreciation for the interrelationships found in nature; and are able to identify common plants, animals, rocks, minerals, landforms and other natural objects. Natural science background in one or more of the following fields: biology, geology, botany, ecology, mammalogy, ornithology, and/or astronomy. 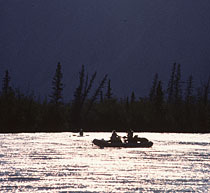 Outdoor educators understand the techniques, equipment and safety procedures associated with a variety of outdoor activities; have taken ample opportunity to learn, practice and refine outdoor skills; and have gained practical experience in leading outdoor activities and/or teaching outdoor skills. In the development of the standards, we researched and compared our standards to those of the Wilderness Education Association (WEA) and the National Outdoor Leadership School (NOLS), both of which had developed curriculum standards for their respective programs. Of course, there is a big difference between a four-year university degree and the programs offered by NOLS and WEA. Where they occur, differences are noted below. Nonetheless, we did find a high degree of agreement between the two national outdoor organizations and a university degree program. If you are developing standards, you may wish to use the same approach, comparing your standards with other programs, and adding commentary similar to what we have done below. Wilderness Education Association. The Wilderness Education Association (WEA) has developed what the organization calls the "18-point curriculum." The curriculum is "designed to teach participants the basics of judgment and decision-making skills, leadership, minimum impact camping and travel techniques, and other essential components" (Wilderness Education Association, n.d.). National Outdoor Leadership School. The National Outdoor Leadership School (NOLS) was one of the earliest of the national programs to focus attention on minimal impact in addition to traditional outdoor education content. Thus, "Environment Studies" which includes "Leave No Trace" instruction is an important part of their program. Overall, the National Outdoor Leadership School is guided by a "Core Curriculum" consisting of four broad topic areas (National Outdoor Leadership School, n.d.). Comments: The ISU outdoor education major covers all topic areas. Comments: "Sanitation and waste disposal" and "route finding and navigation" are topic areas common to all ISU outdoor education majors. Other subjects listed above are covered in the experiential component, but they are not necessarily common to all majors. Actual experiential courses taken are tailored to the student's personal educational and career goals. Comments: "Leave No Trace," "wilderness ethics," "public service" (in the form of a community conservation project) are common to all ISU outdoor education majors. The exact make-up of the natural history component can vary depending upon which courses are taken, but ISU students gain an understanding of the natural world in one or more of the subjects listed. In addition to the comparisons made above, we looked at what other authors and researchers had written on the subject, the results of which are elaborated below. As mentioned previously, you may wish to use a similar approach, using research and papers on the subject and inserting commentary as demonstrated below. Research: Competencies in Outdoor Education. Michelle Richardson and Deborah Simmons in a 1996 ERIC Digest article (United States Department of Education, Education Resources Information Center, 1996) summarized work on "studies that have had a major influence on developing standards of competence in outdoor education," and outlined "leader skills needed for effective outdoor education . . . ."
Richardson and Simmons' listed and elaborated on seven content areas based on performance standards of the North American Association for Environmental Education (NAAEE). It should be noted that NAAEE, as its name suggests, primarily represents educators in the field of environment education (i.e. biology, ecology, ornithology, etc.). That's different than the Idaho State University outdoor education major which is designed for leading outdoor trips and teaching outdoor recreational activities (i.e. climbing, kayaking, canoeing, etc.). Research: Elements of Effective Outdoor Leaders. Building upon several studies, researcher Simon Priest (1997) has identified twelve elements of an effective outdoor leader. The elements can be grouped under three basic categories consisting of hard, soft and meta skills. Research: Outdoor Leadership Curricula. After a review of the literature, Edward Raiola and Deborah Sugerman (1999) proposed a list of nine topic areas to be covered in an outdoor leadership curriculum. As mentioned above, the process of developing a set of standards for outdoor education was a healthy and enlightening exercise, but I do also want to express some cautions about the standards-based methodology. Certainly, we all agree that outdoor educators need to be accountable to our students -- and to our stake holders. In public institutions, of course, the stake holders are the tax payers. In that light, the question becomes, how do we achieve accountability in an effective manner? Will embracing the standards based movement assure us of high quality programs? There is increasing evidence and a growing acknowledgement among the public that the standard based movement doesn't have all of the answers. It's not a magic wand that we can wave over our programs to turn them into gold. In fact, some implementations of accountability methodology, especially when it comes to testing, may do more harm than good. One of the dangers that I see in our profession is the adoption of a set of national standards that all programs must follow. Many of us, of course, would welcome "guidelines" developed by national organizations to use as a basis for our own standards. But national standards which claim to be "the" answer for all programs is the wrong approach. Each of us operates in differing educational environments. We have different goals and different purposes for our major and minor programs. We have different budgets, different amounts of institutional support, different faculty compositions, and different resources. We each need to tailor standards to our own strengths and resources. To do otherwise, cheats students and results in lower quality and less accountability. Moreover, it's not healthy for the field, smothering innovation and independent thought. There's another danger in the development of national standards, and that is the specter of standardized testing. As the Education Week (n.d.) article quoted above clearly asserts, the standards based approach doesn't end with the setting of standards. That's the beginning. The next step is to evaluate student progress toward meeting those standards. Evaluation of student progress can take many forms, but in public schools, evaluation is moving into the realm of standardized testing. It's been a controversial topic, and public schools are increasingly struggling with it as a result of the passage of the Bush Administration's "No Child Left Behind" law. Could standardized testing come to the outdoor education field? Actually, it has to some degree with the adoption by some schools of selected national "certification" programs such as wilderness first aid and instructor training programs -- and it could make inroads in other subjects. If the field were to adopt to one set of national standards, the idea of standardized testing may not be far behind. Clearly, we need to develop evaluation instruments to determine whether we are serving our students, but should this become a nationalized process? Standardized tests have their uses and can be helpfully included in a “toolkit of assessment practices” adopted by individual institutions. But it would be profoundly misleading, and in the long run, injurious to higher learning, to select any one test and make that instrument a national measure of comparative educational quality. Let us hope that the outdoor education field embraces the same approach. H.R. 6, 103d Cong., (1994) (enacted). Retrieved December 5, 2006, from http://www.ed.gov/legislation/ESEA/index.html. H.R. 1804, 103d Cong., (1994) (enacted). Retrieved December 5, 2006, from http://www.ed.gov/legislation/GOALS2000/TheAct/index.html. Ornstein, A. C. (1988). About teachers and teaching. Peabody Journal of Education, 65(3), 12-20. Priest, S & Gass, M. A. (1997). Effective leadership in adventure programming. Champaign, IL: Human Kinetics. Public Law 107–110, 107th Cong., (2002) (enacted). Retrieved December 5, 2006, from http://www.ed.gov/policy/elsec/leg/esea02/107-110.pdf. Raiola, E. & Sugerman, Deborah (1999). Outdoor leadership curricula. In J. C. Miles & S. Priest (Eds. ), Adventure Programming (pp. 241-245). State College, PA: Venture Publishing Press. Schneider, C.G. (2006, March 14) [Letter to members Secretary of Education's Commission on the Future of Higher Education], American Association of Colleges and Universities. Retrieved November 11, 2006, from http://www.aacu.org/about/Commission.cfm. Wilderness Education Association (n.d.). WEA NSP curriculum. Retrieved December 14, 2005 from http://www.weainfo.org/nsp.html.